Roost is a design & maker project that began in Muirhouse during my artist residency with North Edinburgh Arts for a public art commission. Roost’s aim is to create ‘maker’ opportunities for people to share their stories, skills and knowledge and to design, create and make for Edinburgh communities. September – November ’16 saw 200 birdhouses ‘pimped’ by the local community, NHS staff, Scottish-based artists. 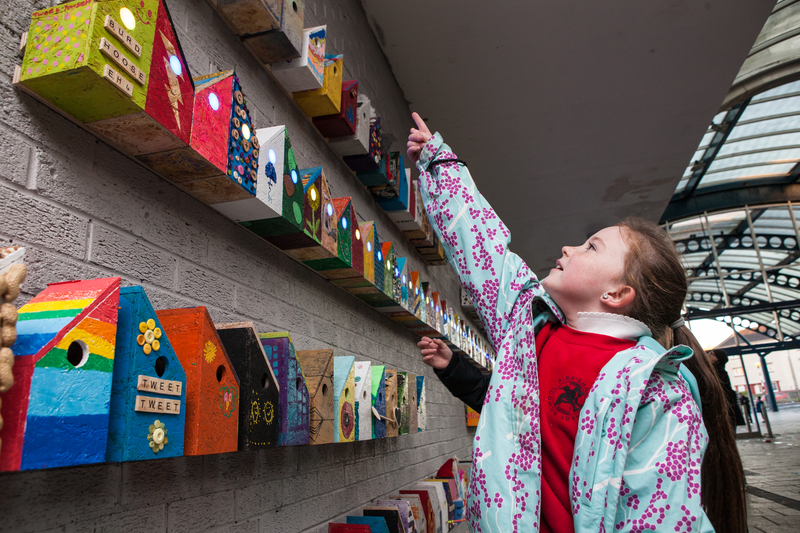 The 200 birdhouses were brought together for a weeks interactive light installation in Muirhouse Shopping Centre. In early 2016, ROOST built 200 birdhouses from OSB. Two hundred fresh and beautiful blank canvases. We then spent four months working with the local community and NHS Lothian staff in blinging up about 160 of them and invited 40 Scotland based artists to make their mark on them too. The project was called ‘PIMP YOUR ROOST’. The end result was a celebration and a symphony of creative individuality! 200 fabulously unique birdhouses! The 200 ‘pimped’ birdhouses became an interactive light installation in the Muirhouse Shopping Centre for a week. 60 of the birdhouses had LED lights in them for interactivity, a responsive disco even! In May ’17 ROOST will host an auction of the birdhouses. There are 200 birdhouses, some are going back to owners, being given as gifts for the gardens and green spaces of Edinburgh. Many birdhouses have been donated to the ROOST auction to help raise money for a local charity. See here for more info.